Last year’s Hiking Trip was epic so we are doing it again! This year it will be on March 9th (Saturday). You can meet us at any part of this event. We will be at The Lake Shrine, Topanga National State Park and we will be having dinner at Inn of the 7th Ray! Meet at 11am at The Lake Shrine in Pacific Palisades. This is one of the most beautiful places in all of California, if not the world. A serene and magical lake surrounded by gardens this is a must see for all people. It’s free to park and enter. Parking can be tough so be sure to reach out to others through the THM Facebook group to carpool. There are beautiful picnic tables there where you often see deer right from the picnic area. We will eat and enjoy the fresh ocean air until 2pm. Then we will begin our excurision through the trail that I’ll show you that actually goes through trees! Where else can you find a hike through trees in So Cal!? It’s not a beginner hike so be ready to get some stronger muscles. Remember your water bottle! 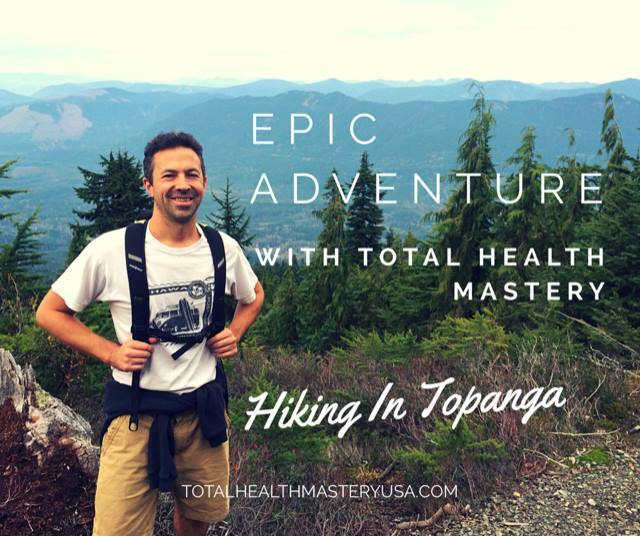 We will hike to the top of the mountain to the famous Eagle Rock, one of the best destinations in all of Los Angeles. From there we will enjoy epic ocean views and possibly do some yoga, 5 Tibetan Rites, Super Power Breathing, secret Qi Gong that I know or… just relax and enjoy the view. We will see how we feel. Then we hike down a different very flat trail where you see the ocean the whole time. It’s so beautiful! After the hike we will head to Inn of the 7th Ray. One of the most beautiful and romantic places to eat in all of California. Their food is very clean and they do offer a couple of organic raw vegan dishes. Feel free to drink wine, beer and eat the grass fed beef! LOL! It’s time to have fun! You are welcome to come for part or all of the day! Anyone can come. All are welcome! Invite your friends and family. Forward this event page. Be sure to RSVP in on this event page. If you are coming for dinner be sure to email Merit at merit@totalhealthmaseryusa.com so we can make reservations!